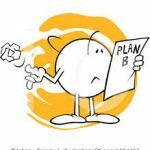 PLANNING GIVES A SENSE OF CONTROL? Can you accept the fact that planning does not guarantee control? CAN YOU ACCEPT THE FACT THAT NONE OF US KNOW WHAT WILL HAPPEN FROM DAY TO DAY? Has every aspect of your life turned out just like you planned? What about your career? Sometimes, just when we have developed that perfect plan …life happens. Let’s explore a few actual Just when… planning outcomes. Just when… you think you have defined your professional direction and landed the perfect career; the company downsizes or merges with another organization and your best laid plans are shattered. Just when… you have made your retirement plans come true with a daily game of golf, taking a walk on the beach in the evening under the stars and living the perfect life of relaxation and leisure; a hurricane threatens your enjoyment and possible basic existence. Just when… you have prepared for months for that dreamed of soccer tournament by eating the right foods, conditioning with the experts and have met all the qualifications; you are playing a practice game and suddenly something goes wrong. You tear an ACL – requiring surgery and you are eliminated from playing in soccer the tournament of your senior year of high school. Just when… you have developed a financial plan for your early retirement, you are carefully monitoring your monthly spending and making adjustments, as necessary, to ensure a perfect outcome. Then life tosses that planning out the window with a major unexpected expense and you are required to respond to the needs of the moment. Just when… President Trump, his staff and congress had to make a decision that seemed to go against all his campaign promises for projected timeframes, spending and results. The catastrophic events created by the destruction and threats of multiple hurricanes refocused a political platform temporarily to save lives and deal with the immediate happenings. The real world! Just when… I was ready for a perfect week of relaxing on a Florida vacation wrapped in lovely weather, welcoming ocean breezes and pleasurable moments of burying my toes in the sand; hurricane IRMA presented me with day-to-day decision making week, instead. Finally, with a million other decision makers traveling north I made a 19 hour driving trip back to my home in Tennessee. At times feeling like I was caught in a ‘highway hurricane’ of some sort! That outcome was definitely not part of my original vacation planning process. It goes to show that no one, no event, no business or no government is exempt from potential unexpected setbacks. Having said all that, this article is not about failed politics, poorly planned life and career goals or lack of success in following our dreams. It is about being aware that regardless of how prepared we are we must be open to handle ‘the truth’ of the moment. This is true for a life or lifestyle impacted by unexpected challenges, a corporate strategy facing devastating business realities, a health issue changing the outcome of a dream, a professional career goal being relinquished because of uncontrolled happenings and a well planned financially secure retirement life suddenly faced with an unexpected tragedy. I will leave you with your own views or perhaps even personal experiences; and close this article with a comment, a question and a thought! My Comment: I am in no way suggesting that planning is an obsolete concept. Simply reinforcing an idea that just when you think you have it all together…life happens! My Question: Can you accept that, in the big picture of life, you are not in control of the events that may impact your carefully laid out life, career and dream plans? My Final Thought: It is just a possibility that these major disruptions may bring unexpected gifts that would never have been known or experienced had they not happened. Talking about something versus actually living it is a very different experience. My hope is that in some way this topic and my words have raised your awareness about facing disruptions with faith and trust that what is on the other side will make you a better person and the world a better place.